Casting the Age of Miracles - too soon? 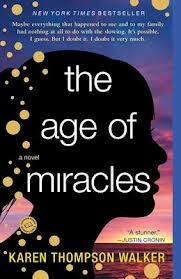 I first learned that the film rights to Karen Thompson Walker's Age of Miracles had been sold - even before the book hit the shelves - last January, 2012. Hanna screenwriter, Seth Lockheed is on board to write the adaptation. Word and Film have a piece suggesting some casting ideas, including a few young actresses for the pivotal part of the rather introverted Julia. I like their idea of Kiernan Shipka, Don Draper's daughter on Mad Men but she may be too old by the time this happens - Julia's 11 while Kiernan is 13 already. 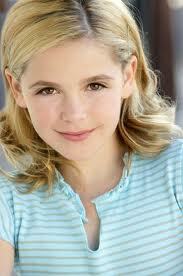 I want to add Jackie Evancho to the list; she's a whopping year younger! We'll see the America's Got Talent singing prodigy soon in Robert Redford's The Company You Keep, not singing - as far as I know. And as far as I know, no deals have been made at this time, the movie is still listed as being in development so who knows how old anyone will be when the cinematic ball gets rolling. Do you agree; is it too soon to talk about casting? I've just finished reading the book myself. I'm not entirely sure what I think about it; it definitely didn't bore me; I was glued to the page. But there's something stopping me from gushing j'adore, or wowza or something, and I haven't quite crystallized what that is yet. I'll get my thoughts together at some point. We didn't notice right away. We couldn't feel it. We did not sense at first the extra time, bulging from the smooth edge of each day like a tumor blooming beneath the skin. It was October, but it felt like July: The air was summer air, the sky a summer sky, still light past seven o'clock. Posted for First Paragraph Tuesdays at Bibliophile by the Sea. Posted for Teaser Tuesdays over at Should Be Reading. So what do you think? About the casting and the book? I still need to read this one, but from the reviews I've read, it sounds like it would make a good movie. Oh, I didn't know that this book was going to be made into a movie! I actually just got the book from the library recently. I'd love to know what you think of it when you're finished. I didn't know there was going to be a movie! I have yet to read the book! It has been sitting on my stack. yep, i know the feeling. way too many books, way too little time. That's an arresting premise! I'll come take a look; thanks for stopping by, David. the idea for the content of your blog-and it's title-chapter 1 take 1-really really interesting-trust me-i've seen more than 300 blogs in the past few days-because i was commenting the above inviting message-but your blog-it stands alone.-I've followed. thank you very much-specially for not only reading my posts but also the comments and for those valuable links-i read scripts on the imsdb specially when i've vocabulary issues,but have not heard of the comics link. I want to be a filmmaker not a critic-but there is a part of each in each. i can't go out with a camera-because the moment my parents know -i'm done.I'm typing this after closing the door saying that don't disturb me when i'm studying-here you depend on your parents till 26-that's when the university ends here-and there is no part time jobs-anyway i will one day do it once i'm in UK or USA.